Vineland Gewürtztraminer 2002 - perfect gewürtz nose, mouthfilling with grapefruit bitterness. East Dell Barrel-fermented Chardonnay 2003 - bright, chablis-like aromas; rich, complex palate with wood, butter, guava & pear; long finish with acid note. So how was that Hermitage, anyway? Impressive, in spite of its youthfulness: the nose intoxicating all by itself; lots of earth and berries; beautifully balanced; delicious! 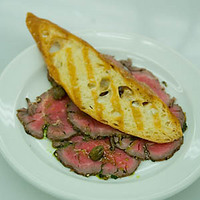 Food accompaniment: Beef Carpaccio with Parsley Oil, Capers and Peppercorns - I say lose the capers ( ;-p) The wine: Hermitage Domaine Jean-Louis Chave 2001. Côtes du Rhône – Les Brottiers – Brotte2003 $12.15 at Vintages (Very good value! ): nose of cloves, pepper and alcohol; flavours of stewed and dried fruit, somewhat tannic with a sweet, earthy, tannic finish. 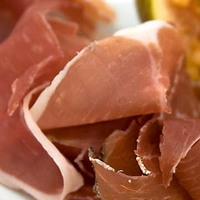 Served with Prosciutto, a fine match. Côtes du Rhône – E. Guigal 2001: Greater intensity and elegance; full-bodied with cherry tones and bitter finish only $17.65 at Vintages. 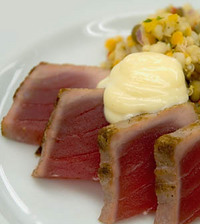 Matched with Seared Tuna with Lentil and Quinoa Salad; Unfortunately, the wine overwhelmed the timidly-seasoned dish. Chile’s vineyards have been producing fine fruit for centuries, but in the last two decades, viticultural research in conjunction with substantial amounts of capital improved quality immeasurably. Well-established large wineries make and market superb wines that can compete with the best anywhere. Recent developments indicate that all are now making concerted efforts to increase their world market share, and they stand a very good chance in succeeding simply because their prices are more than competitive. Labour costs are low, land is inexpensive, and vineyard maintenance requires fewer hours than those on steep slopes, as is the case in many European regions. Weather patterns remain constant year after year. Variances are small enough to be barely noticeable. So successful have been the likes of Concha y Toro, Vina Cousino-Macul, Vina Santa Rita, Vina Santa Carolina, and Errazuriz that European wineries felt compelled to invest in the Chilean viticulture. 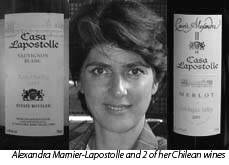 Casa Lapostolle, Baron de Rothschild, Caliterra and Torres are only some of the famous investors. Recently the Chilean trade commissioner in Toronto staged a blind tasting of her country’s wines. The results were revealing to say the least. Label bias was excluded, and as a result, tasters (mostly wine writers) recorded their impressions without prejudice.